Institute's Niall Grace attended Saturday's match against Lurgan Celtic. Institute’s Niall Grace is determined to get back out on the football pitch. The big midfielder is still on the road to recovery after he suffered a serious head injury during an incident in the city centre in the early hours of September 11. He was initially treated at Altnagelvin Hospital before being transferred to the Royal Victoria Hospital in Belfast and remained in intensive care for some time. But since then he has made a remarkable recovery and even attended Stute’s narrow 2-1 win over Lurgan Celtic on Saturday. The 23-year-old will be waiting until he gets the thumbs up from the doctor that he can return to the training and equally important is that he receives the green light from his family, before he steps up his recovery. “It’s pretty frustrating for me that I have to wait but again for my family and friends I’m happy enough to wait because I know how scared they were at the time,” he said. “So until I’m given the go-ahead that I’m allowed to get back to my own fitness and back playing football, I’m happy enough to wait. Again I’m waiting for my Mammy and Daddy and the doctor to give me the go-ahead, so until the doctor says ‘look Niall you are ready to go back’, I’ll then wait until my family is ready. “Again I’m waiting for my Mammy and Daddy and the doctor to give me the go-ahead, so until the doctor says ‘look Niall you are ready to go back’, I’ll then wait until my family is ready. “But I just can’t wait to get my fitness back, back playing football and back to where I was and the ultimate goal is to get back out on to the pitch. Grace admits he’s still coming to terms with how serious an injury he suffered but he’s slowly starting to get back to his old self. “I’m still coming to grips with that, as I’m gathering information from my family about how serious it actually was and how close I actually came but I’m still getting to grasp how serious it was but I think after seeing all the messages on Facebook and speaking to my own family, I’m starting to understand how lucky I am and how close I came, but I’m happy now where I am,” he added. “I can’t thank people enough for their support, the reaction and support from everyone has really taken me back. 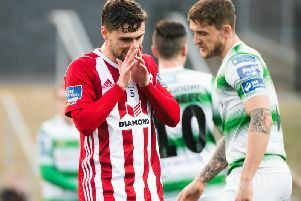 “People couldn’t do enough for my family and it just shows you how big a family Stute is and not just Stute, but local football and people in Derry really do look out for each other. “Even people from outside of Derry have been messaging me and they couldn’t do enough and that kind of thing really took me back, as it was amazing. “I’m feeling like myself and each day it seems to be getting better but I’m just glad to be out and about watching a bit of football.